I was visiting a friend who is a principal and found myself frequently alone as another “usual” school issue arose. As I often do, I began pursuing the bookshelf for a distraction and a chance to find out what I might be missing. 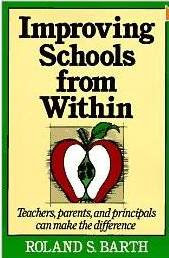 I found a copy of Improving Schools from Within by Roland Barth (Jossey-Bass 1990). While I had read and quoted from several articles by Barth, I hadn’t read this book. Reading a few pages lead to a request to “borrow” the book which I finished reading over the next three days. If you have missed this earlier as I did, its worth a read now (used copies available). I was surprised by how Barth’s descriptions of difficulties facing teachers and principals were still the same and in many cases even more severe. My statement: Until a school becomes collegial it will not reach maximum student achievement.Positively phrased: If we can increase teacher collegiality, it will have a positive impact on student achievement. In working with instructional coaches I have suggested that one of their job descriptions should be the building of teacher collegiality. One reason I have suggested that is that rarely is there sufficient time for the coach to provide all the coaching that needs to occur. By getting teachers to be collegial and coaching each other, the coach’s work is more likely to impact students. Building a collegial culture takes conscious, purposeful actions. I have written several times in this blog about the instructional coach and principal partnership.The coach should make the principal look good. The principal should make the coach look good. In that situation teachers are most likely to place confidence in both the coach and the principal as a culture of collegiality is modeled by these two school leaders. I often recommend the coach and principal publicly coaching each other. What signs indicate the quality of collegial relationships currently existing among our staff? Do we see signs of teachers being congenial but not being collegial? Are there signs of parallel teaching (near each other not with each other)? Are interactions among teachers improving teaching and learning? What actions can we take as leaders to build the culture of collegiality? Are we seeing collegiality in PLC’s, departments, grade levels? Where is collegiality evident across content areas and grade levels? Can we make it easier for teachers to have time for observing and coaching each other? Are we using our professional development resources to build collegiality? How much is collegiality being modeled by the leadership team? Nice post, Steve. Barth’s work has always influenced my approach to building a collaborative school culture. Barth’s distinction between congeniality and collegiality is an essential understanding we must have in order to really move forward with meaningful collaboration. I have seen schools where congeniality got in the way of collegiality. What would you believe to be the necessary steps or tasks to now introduce an instructional coach to the principals, teachers, and school community? I am working on a timeline and would greatly appreciate your help and guidance. Can you please advise on the necessary steps or tasks involved to introduce instuctional coaches into a school? I am one of nine instructinal coaches and we need to develop a timeline and action plan for this to happen. Greatly appreciative of any help. This is a great reminder that I’ll share with my principal so she can bring forth to staff again. It’s also an affirmation of something good I did this week. I poked a grade level team through an email with the idea of getting together to look at student writing. it’s near report card time and I know that time is tight, but I also remember how challenging it is to decide whether our borderline kids meet CORE or not for the report card. I figured it would benefit teachers to work together to analzye their students’ writing. Amazingly enough, they all agreed to meet with me as a team! Yeah for collegiality!